Turning around is a universal animation that allows characters to change their direction. All characters have at least two kinds of turning animations: regular turnaround (called Turn in Melee's debug mode) and run turnaround (called TurnRun in Melee's debug mode). The standing turn animation lasts for 11 frames, but can be acted out of on frame 6. Shielding, grabbing, jumping (and therefore up smashing) will cancel the turn and be performed immediately, all other moves will be buffered and performed on frame 6. However, when inputting attacks that require a direction (tilts, up-B attacks, etc.) the direction must be held until frame 6, or the attack will occur without the direction. For example, inputting a down-tilt on frame 2 of a turn will result in a jab if down isn't held until frame 6. Input-output map of the control stick during Wait. Dashing is only possible after frame 1 (for smash turns) / frame 5-9 (for tilt turns; varies between characters). This fact makes dash-dancing possible. A dash from a turn can be canceled into another turn from its first frame on, opposed to dashes done from other action states, which can only be canceled into turn starting from after frame 4. Neutral special moves cannot be used at all. Walking and sub-sequent turns cannot be used before all 11 frames of the turn animation have passed. A smash turn is a turn that is triggered by holding strong backward (referred to as a smash input from now on). For turns to the left, the control stick x value range (y is assumed to be neutral at 0, minor variations don't make a difference) is -1.0 to -0.8. For turns to the right, it's 0.8 to 1.0. 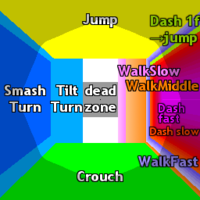 If the smash input is still present after the first frame of Turn, a dash is triggered. If the x value changes to the middle section (-0.78 to 0.78), the Turn animation will continue without another opportunity to dash until its 11 frames have passed. Smash turns turn the character around on frame 1. For example, if a player controlling Fox makes him stand in his Wait animation facing right, holds strong left (smash input to the left) for 1 frame and then presses a jump button on the next frame, Fox will jump facing left. Tilt turns turn the character around on frame 5-9 (depending on character). For example, if a player controlling Fox stands in his Wait animation facing right, holds weak left (tilt input to the left) for 1-4 frames and then presses a jump button on the frame afterwards, he will jump facing right. If he holds weak left for 5 frames and then presses a jump button on the frame afterwards, he will jump facing left. This direction reverting also applies for shielding and sliding off from a platform, but not for doing any kind of attack. Turning around during the running animation is laggy and avoided in competitive play. Instead, dash-canceling and wavedash are used to regain movement options quickly. This page was last edited on February 9, 2019, at 04:47.